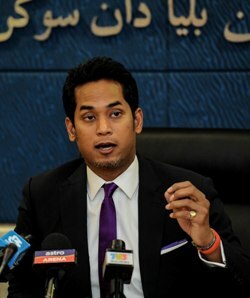 Khairy Jamaluddin wants a detailed audit to determine how MNCF spent their funds. The management of the Malaysian National Cycling Federation (MNCF) face the prospect of being suspended for the mismanagement of funds allocated by the government for the development of cycling, especially road racing. Youth and Sports Minister Khairy Jamaluddin said based on the initial audit report submitted by the audit department of the ministry on Jan 29, there were a number of weaknesses and discrepancies practiced by the MNCF in managing the funds. “After discussing the matter with the ministry Secretary-General and senior officers in the ministry, we have agreed to direct the Sports Commissioner and the ministry’s auditors to conduct a detailed audit on the accounts to present a clear picture. “Action will be taken once we have identified the weaknesses and equipped with a detailed information. But the option (suspension) did cross my mind,” Khairy told reporters after announcing Robert J. Ballard at the technical director for athletics, here today. Khairy said RM2.45 million was allocated to MNCF last year to carry out development programmes for cycling and RM1.5 million from the total was for the development of road racing. In 2012, MNCF was allocated RM2.95 million and in 2011, MNCF received RM1.8 million, he said. Khairy said he had also directed Datuk Jamil Salleh, the ministry’s secretary-general to review the procedure for providing financial assistance to National sports associations. “I find the Standard Operating Procedure (SOP) or guidelines for such assistance very general and probably that could be a reason why there have been mismanagement of funds,” he said.